One research payload includes the University of North Carolina Wilmington’s cubesat, SeaHawk-1, carrying the HawkEye Ocean Color Imager. UNCW has been funded by the Gordon and Betty Moore Foundation, and NASA serves in an advisory capacity to ensure the maximum scientific utility of the science data. NASA’s Science Mission Directorate and UNCW have created a partnership to expand accessibility to the data. Spaceflight is revolutionizing the business of spaceflight by delivering a new model for accessing space. 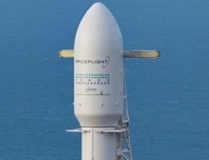 A comprehensive launch services and mission management provider, the company provides a straightforward and cost-effective suite of products and services including state-of-the-art satellite infrastructure and rideshare launch offerings that enable commercial and government entities to achieve their mission goals on time and on budget. A service offering of Spaceflight Industries in Seattle, Wash., Spaceflight provides its services through a global network of partners, ground stations and launch vehicle providers. For more information, visit www.spaceflight.com. SSO-A Fairing on SpaceX Falcon 9. Photograph by Jack Beyer.